Shinwa White Emperor Katana Damascus | BUDK.com - Knives & Swords At The Lowest Prices! Shinwa has a reputation of unrivaled beauty and quality, and this exceptional White Emperor katana lives up to that proud standard. The impressive blade is hand forged and meticulously wrapped in thousands of layers of genuine Damascus steel, giving each blade its own, uniquely beautiful pattern. The handsome tsuba features intricately detailed carvings, and the handle is completed in black ray skin and white cord wrappings. Truly befitting of an emperor, this sword is sure to be treasured for generations. An interesting sword, its strong and durable. Unfortunately the wrap was not done very well, after 5 swings it starts to slide down. Otherwise, impressive steel work and sword potential. I have several swords in my personal collection. (17) And of these eleven are of Japanese design. 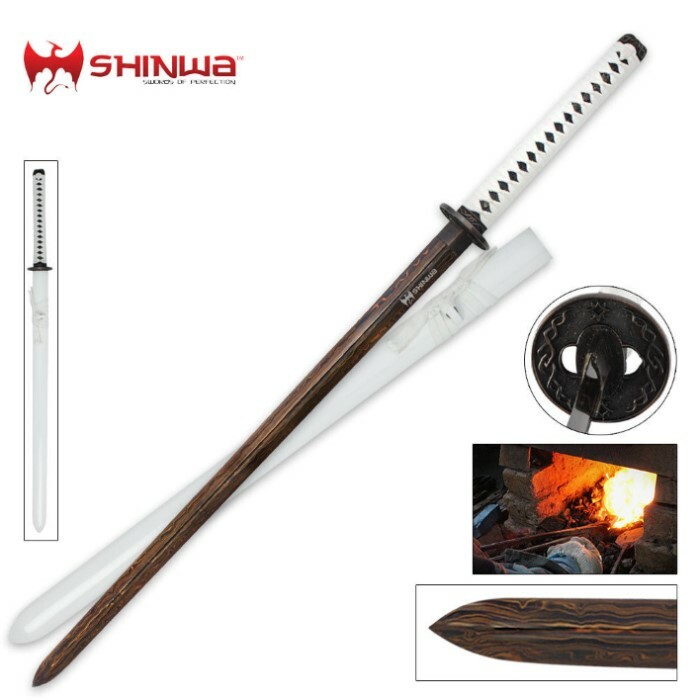 With the exception of a WW2 Japanese Army officer's sword, the replica of Michone's katana from the AMC hit show "The Walking Dead" and an early 19th century original, the other eight are all Shinwa blades purchased from BUDK. And of my Shinwa swords, I must say that without a doubt the "White Emperor" is my favorite! The style seems to be a blend of katana and shirasaya. I would recommend this blade to anybody looking to add a quality Damascus sword to their collection, or if you want a great sword to start your collection. It comes sharp, right outside the box.and the price is unbelievably low! I just received, unpacked and cleaned my new Shinwa White Emperor Damascus Katana and am VERY PLEASED. I have purchased ALL of my throwing knives and axes from BudK and have never been disappointed. In fact, BudK did a V-BLOG video episode featuring my You-Tube channel = Gunny HiWay and my knife throwing skills and room. Now on to the review... 1) The sword is SHARP. VERY SHARP and the blade is straight and beautiful. 2) The sword is in perfect condition. No nicks, scratches or scuffs on either the beautiful Damascus blade(Shinogi) or the bright white, piano painted scabbard(Saya). 3) All of the fittings are tight, nicely made and well fitted. 4) The Saya fits the sword perfectly. SNUG and SECURE, but not too tight. 5) The Cord Wrap(Sageo) is well done, classic and handsome. All in All the White Emperor Damascus is a beautiful, battle-ready Katana. In conclusion, My Shinwa Damascus Katana reflects NONE of the problems posted in these comments, and has ALL of the POSITIVES! I would absolutely recommend this sword and BudK to sell and ship it to you. Carry On, Gunny HiWay Seattle, USA Ps... Thanks to Tricia, Joyce and Kimberly in Customer Service and Theresa in Shipping for making this a terrific purchase. Not a bad sword, came a little late even thought I got the two days shipping, there were a little nick here and there on the blade, but it was sharp, and the weight to it was pretty good, so it was worth the money. Allow me to say that this is my first Budk purchase, and I couldn't be happier. I paid the extra cash to get this Katana overnighted for my birthday and now that I get to see it in person, I'm ecstatic. The Katana is not completely full tang, but it is full tang enough to be considered battle ready, in my opinion. The saya being white with a dark blade is a very nice contrast and not what someone might expect to see. The colors of the blade look oxidized, and some of the copper colored lines wiped away when I properly cleaned it. It didn't leave any hard feeling for me though because it's not that easy to see. For someone looking for a "damascus" look and quality for a decent price, I'd go for it. Ultimately, the sword is beautiful and great for an aesthetic appearance. If aesthetics is all you need? Then buy this sword!